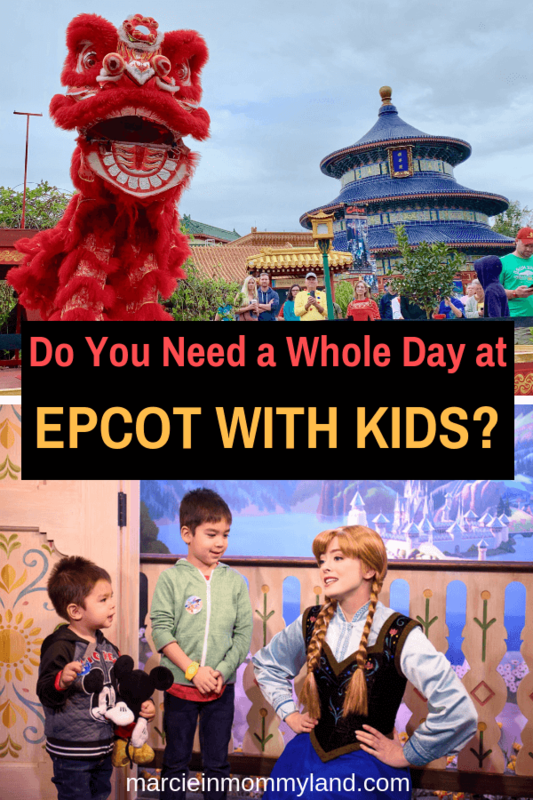 What To Do in Epcot with Kids? 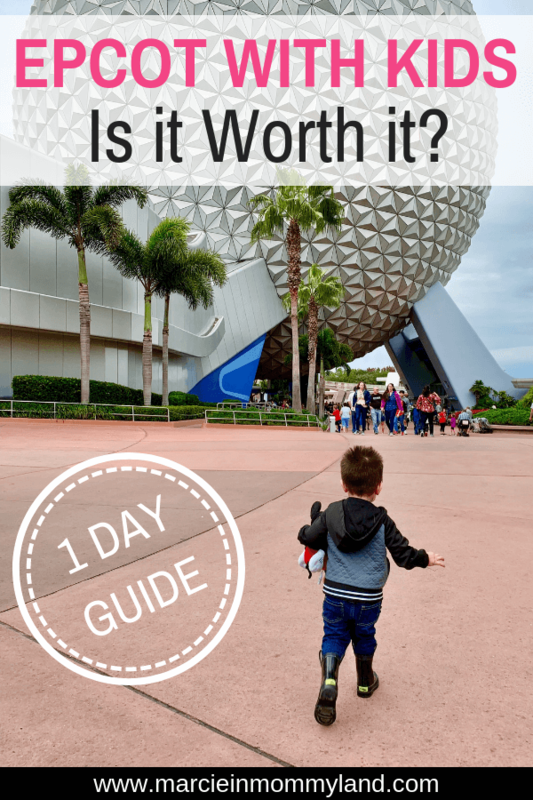 When we were planning our first trip to Walt Disney World, almost everyone I talked to said Epcot was mainly for adults. That made me a bit nervous since it was the park I was most excited to explore! I have to say that after experiencing Epcot with my 2 year old and 5 year old, it was one of our favorite Parks! The main reason people think Epcot isn’t kid-friendly is because there aren’t as many rides as the other parks. But, the rides they do have were actually some of our 5 year old’s favorite rides at Walt Disney World! What’s really cool about this ride is that there are two missions. The green one is less intense. I don’t like scary rides and I wouldn’t consider this scary at all. I’m actually a little surprised that this was also one of my son’s favorite rides at Epcot. Basically, you slowly ride through displays showing how communication has evolved from the cave man to present day. Both my kids were fascinated and had questions after. We did this at Disneyland a couple years ago when our oldest was 2 years old and honestly, I wasn’t expecting much. Well, this was WAY cooler than I remembered and the improv seriously cracked us up! And after, the kids spent a long time playing in Bruce’s Shark World. I’m including this even though we didn’t get to experience it this trip. I spent every free moment trying to score FastPasses, but couldn’t make it happen. 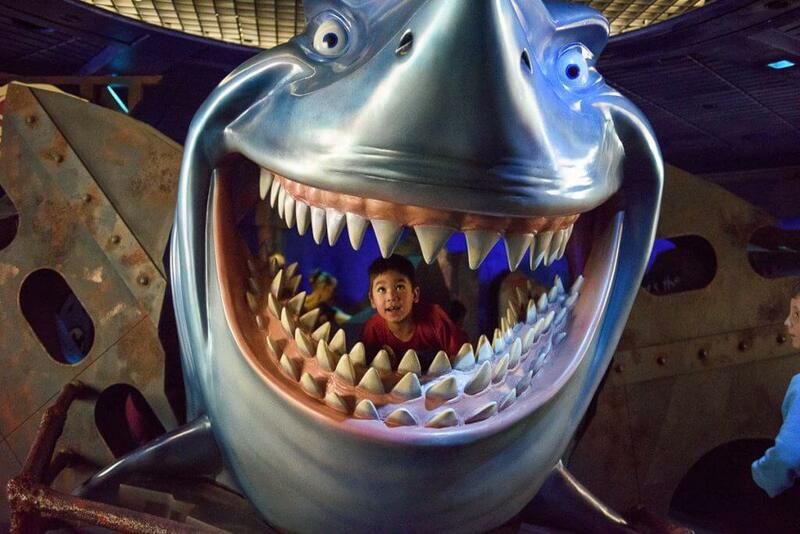 However, I’d be remiss to not add it to my list of kid-friendly rides at Epcot. Basically, it’s a boat ride where you can see scenes from Disney’s Frozen. What’s not to love about that? 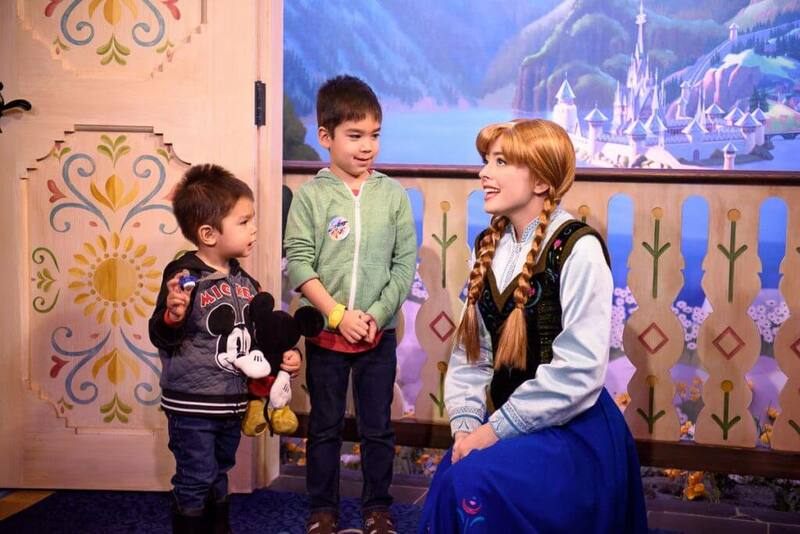 Plus, you can meet Anna and Elsa right next door. Since people kept telling me that Epcot was geared for adults rather than kids, I was worried that the restaurants wouldn’t be as kid-friendly as the other Parks. Again, I was happily mistaken! We had lunch reservations at the Rose & Crown in the United Kingdom Pavilion. My 5 year old was stoked to get a kids menu with crayons here! But, the real treat was when our server brought out their milk with light up ice cubes inside! 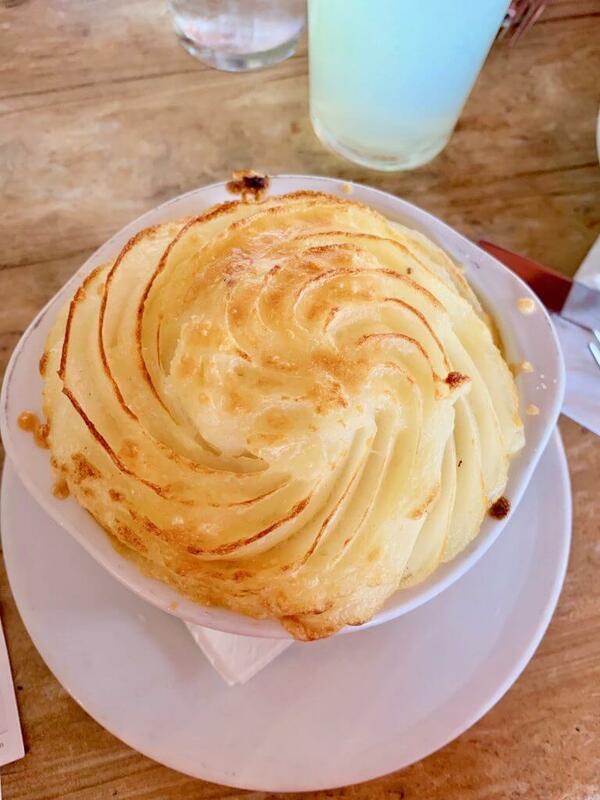 I ordered the Shepherd’s Pie and it was really tasty! That’s my go to order for British food and it was on par with what I’ve had in the past. 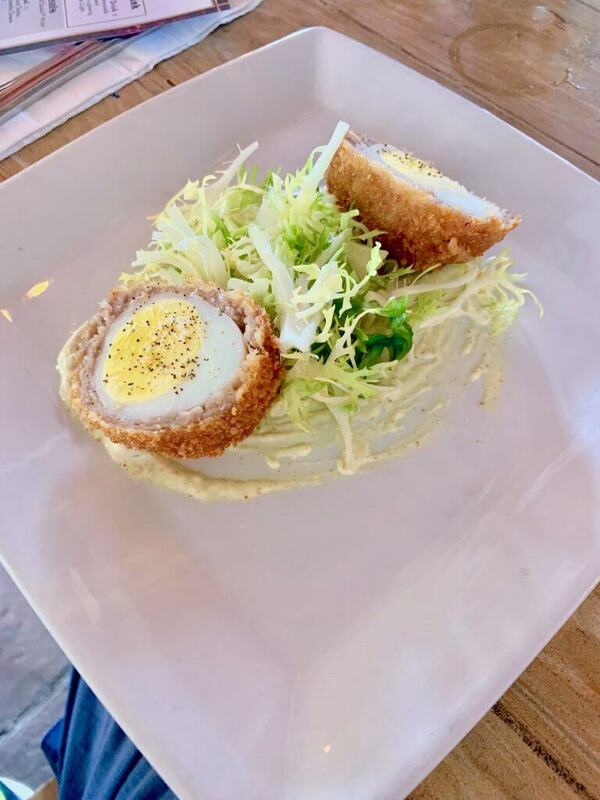 We also ordered a Scotch Egg because we’ve been hearing about them for years, but never had an opportunity to try them. They were a hit! For the kids, they easily shared the Cheesy Pasta and English Trifle. See the full Rose & Crown Pub menu here. The restaurant I was most looking forward to was Chefs de France because I love, love, LOVE French food! We went to Paris with our kids last year and while the food was excellent, the restaurants were fairly small (with tables right next to each other) and it was a bit stressful eating out with little kids. Chefs de France makes the whole experience very kid-friendly! It’s the largest French restaurant we’ve been to and it was amazing to have so much space between the tables. And the food was really flavorful! 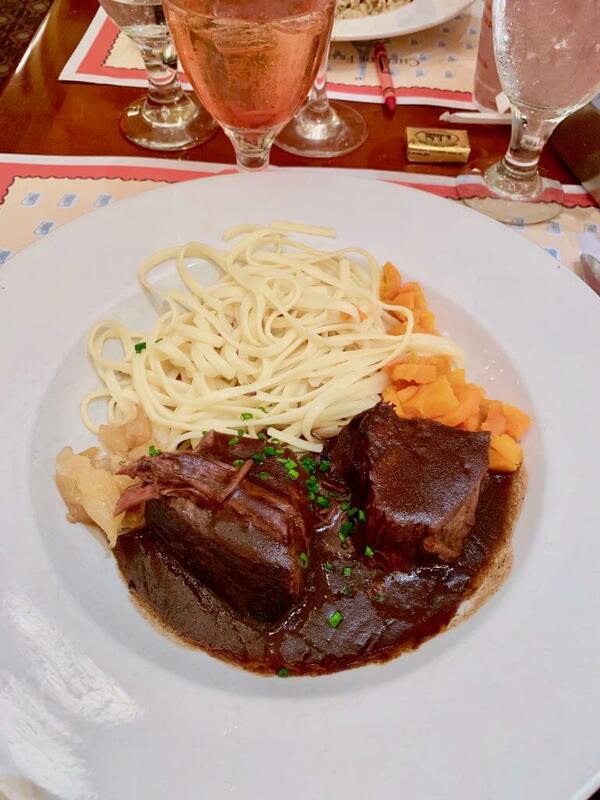 I ordered the Boeuf Bourguignon, which was served over linguine and I practically licked the plate it was so good! This was the first time I’ve had it on noodles and I think I’m going to try it at home! Again, the kids got menus with crayons, which was very exciting for them! The kids shared the pasta with ham which was a generous helping. We took the leftovers home and served it to them for lunch the next day. Don’t worry, there are way more interesting kid options than just macaroni! See the full menu here. Save room for dessert! I ordered the Meringue Aux Fruits Rouges and it was incredible! It was fresh fruit on a crisp, airy meringue cookie topped with cream, raspberry sauce and strawberry sorbet on the side. Sooooo gooooood! But, those are just the ones we ate at. In fact, we almost added another day at Epcot just to get some more tasty food! You can see the full list of Epcot restaurants here. 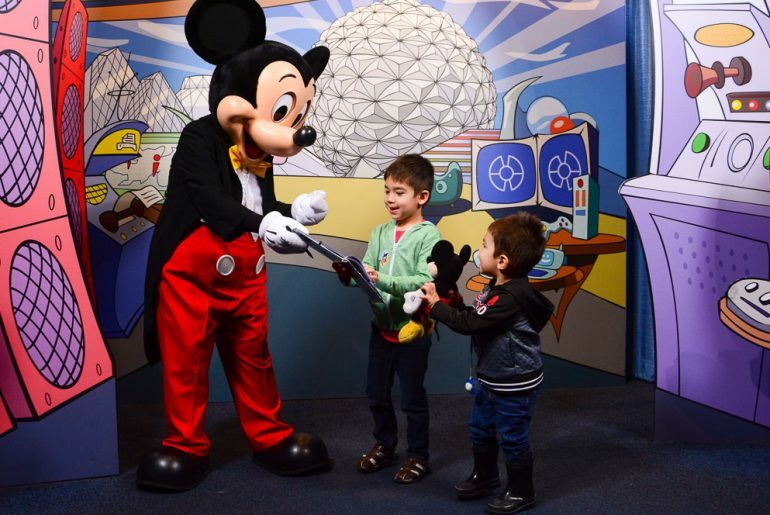 I love that at Epcot, you can get a FastPass to meet Mickey Mouse, Minnie Mouse, and Goofy all in one area. We were in and out within 10 minutes! 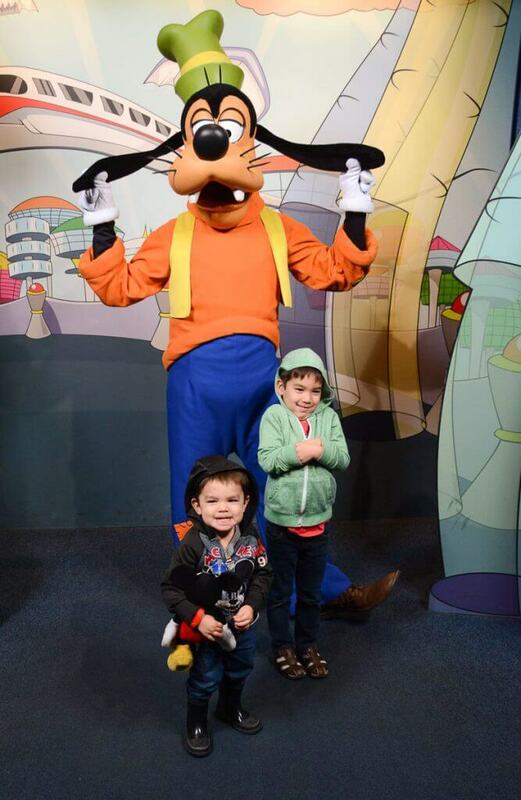 Plus, our kids met Pluto as soon as we walked into the Park. And Donald Duck is stationed in the Mexico area. 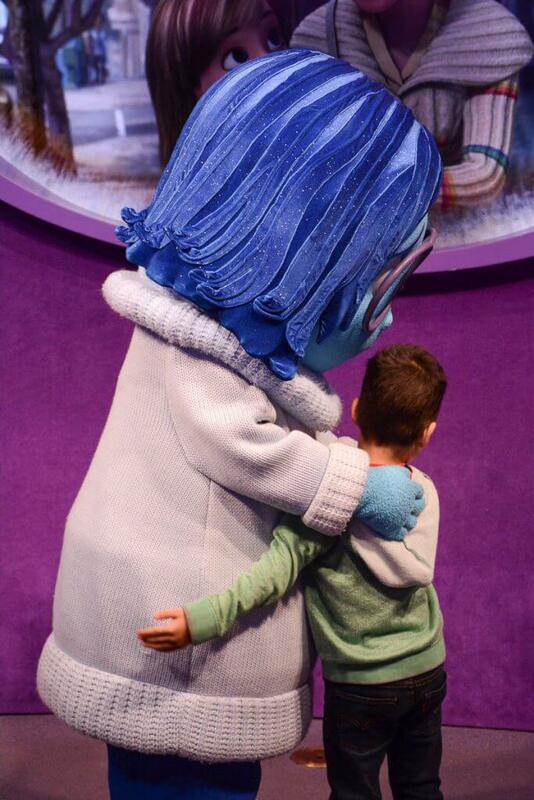 Epcot is also the only place to meet Joy and Sadness from Pixar’s Inside Out and Baymax from Big Hero 6. We also saw Mary Poppins and Alice (from Alice in Wonderland) hanging out in Great Britain. But, I think Epcot is the best place to take photos with Disney Princesses! Which Princesses are at Epcot? 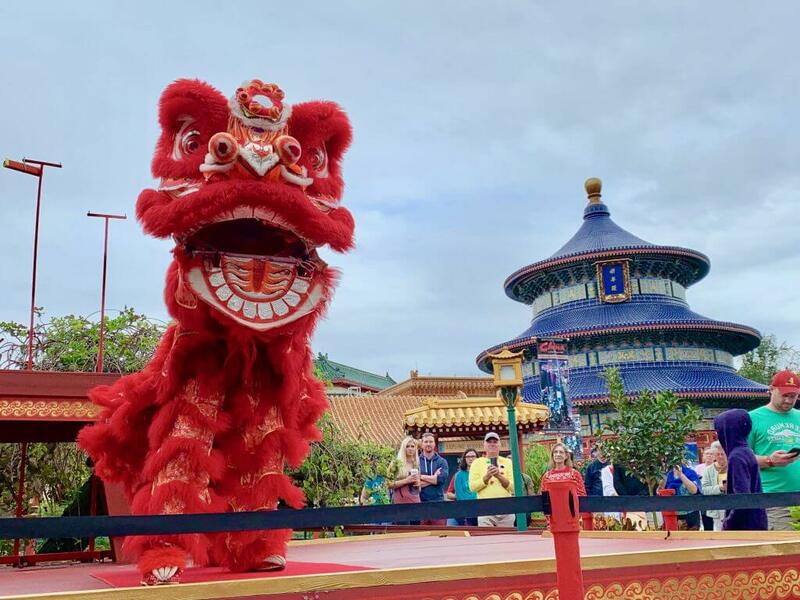 Mulan: It makes perfect sense that she’s in the China Pavilion! When we were there, she was standing on a bridge in a garden and she looked stunning! Belle: You can find Belle in the France Pavilion. When we were there in December, she was in her red and gold holiday dress right next to the stage! Aurora: When Belle isn’t in the France Pavilion, Princess Aurora takes her place. Anna & Elsa: Head to the Norway Pavilion to take photos with Anna and Elsa inside their palace. Even waiting in line is interesting because there are so many things to look at! Snow White: I didn’t remember that Snow White was a German tale until I saw she was meeting guests in the German Pavilion near the Wishing Well! Jasmine: Princess Jasmine spends her time in the incredibly detailed Morocco Pavilion. 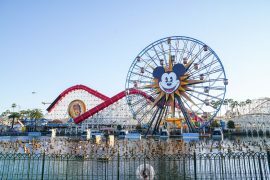 Insider tip: This is a great Park to pack a few costumes for your kids because the backdrops are stunning and the natural lighting is perfect for frame-worthy photos! If you don’t want to wait in line to meet Princesses at Epcot, you can book a character meal at Akershus Royal Banquet hall in the Norway Pavilion. You’ll meet several Disney Princesses, but you never know which ones will be there. If you have your heart set on meeting someone particular, it’s best to stand in line at their meet and greet spot instead. 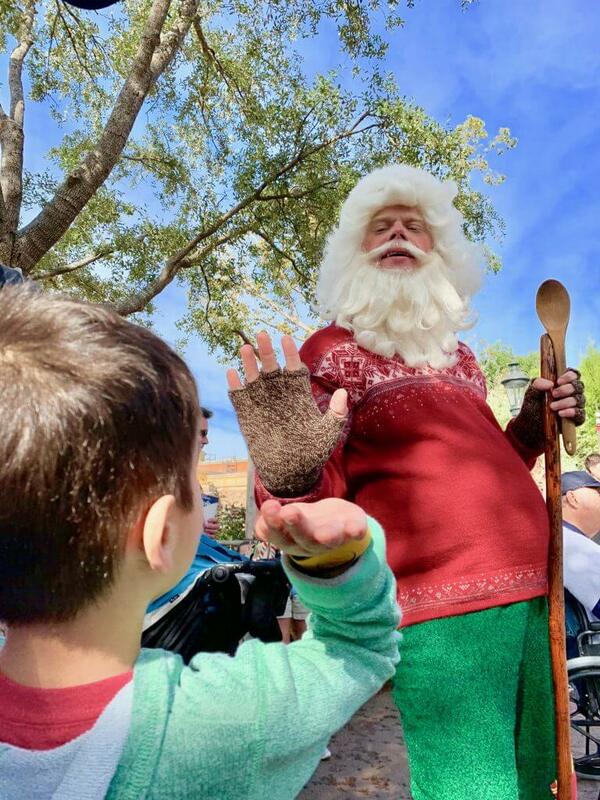 I’m really happy that we got to spend our day at Epcot with kids during the Christmas season! Not only were the countries decorated for the holidays, but they featured Christmas and Hanukkah presentations! Make sure to grab a Times Guide to get all the times of the holiday presentations because many of them line up so you can see several back to back. Plus, each country offered special treats and souvenirs you can only find during the holidays. Insider tip: We found that Epcot was the least crowded park during the holidays, so schedule it in the middle of your trip as a nice break! When I was doing research for our trip to Epcot with kids, I kept hearing parents talk about the Kidcot Fun Stops. From what I gather, each Pavilion offers art activities for kids to do while cast members talk about their country. Then, kids can put all their artwork in a Ziploc suitcase bag as a free souvenir. Since we went during the holidays, there were so many amazing programs going on that we didn’t have time to do any of the Kidcot Fun Stops, so I don’t have any personal tips or tricks. 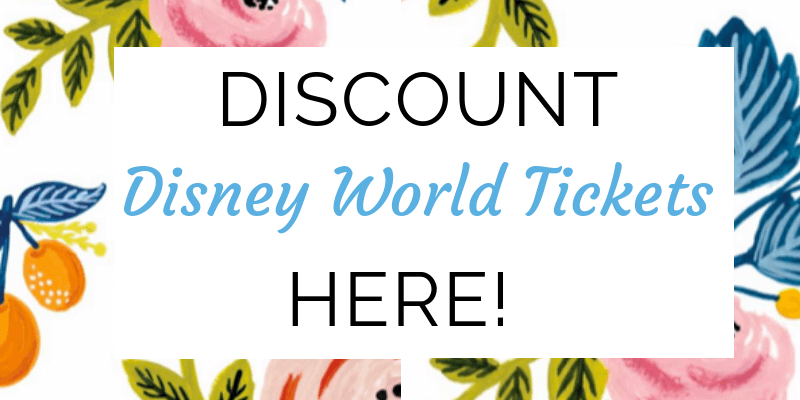 But, you can read all about it on the Walt Disney World site here. We got there about 15 minutes after the Park opened. My husband and kids went to take photos with Pluto while I hit the restroom. Then, we wanted to start exploring the World Showcase when it opened. 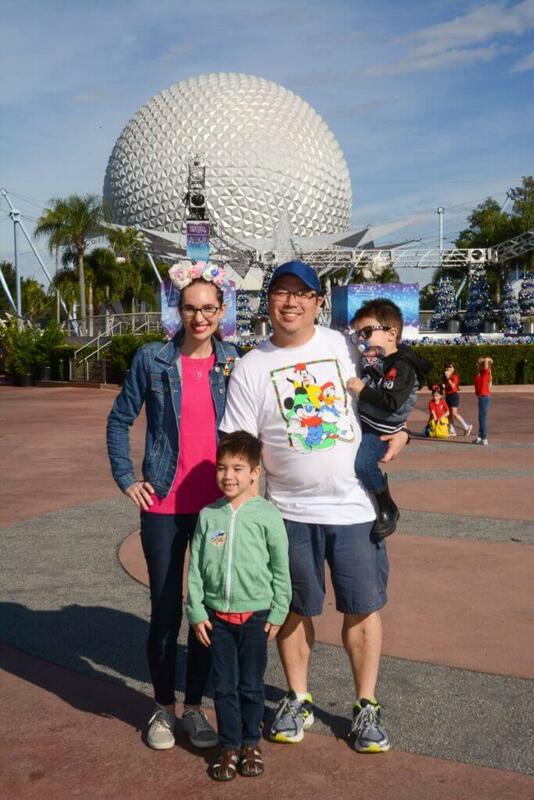 We grabbed a quick PhotoPass photo in front of the Epcot geosphere. And then we headed to the Norway Pavilion. The line to meet Anna and Elsa wasn’t very long, so we decided to do that. We left our autograph books in the stroller, but they were so nice and had blank pieces of paper to sign so they boys could add it to their books later! After that, we did a PhotoPass family photo in front of the Norway stage, which was all decorated. We met a guest there who told us all about the holiday presentations and let us know the Norway one was starting momentarily. So, we stayed for the Norway Santa presentation, which was hilarious! That gave us just enough time to use our FastPasses for the Epcot Character Spot before lunch. 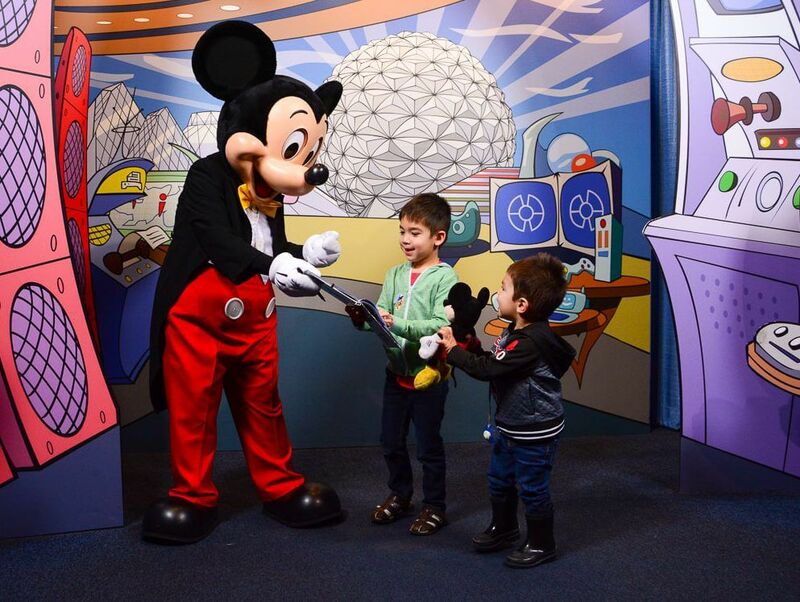 We met Mickey, Minnie and Goofy in record time and they were so playful with the boys! We had Noon reservations at Rose and Crown. This is an adorable pub in Great Britain and the food was fantastic! My kids were impressed with their kids menu and the light up plastic ice cubes in their milk. Confession: we did take the ice cubes home with us and they are still delighting our kids on a daily basis! We took a look at our Times Guide and decided to do the full loop in the World Showcase. Since we were already in Great Britain, we walked to France to see their Pere Noel presentation. It was great and he stuck around to do photos. We tried getting in line to meet Belle, who was all dressed up for Christmas, but they closed the line. The Epcot pavilions are just so cool that we wanted to spend some time exploring each of them. So, we walked around France, Italy, Germany, Morocco and Japan. One of the things we saw was a model train that went through a little village. 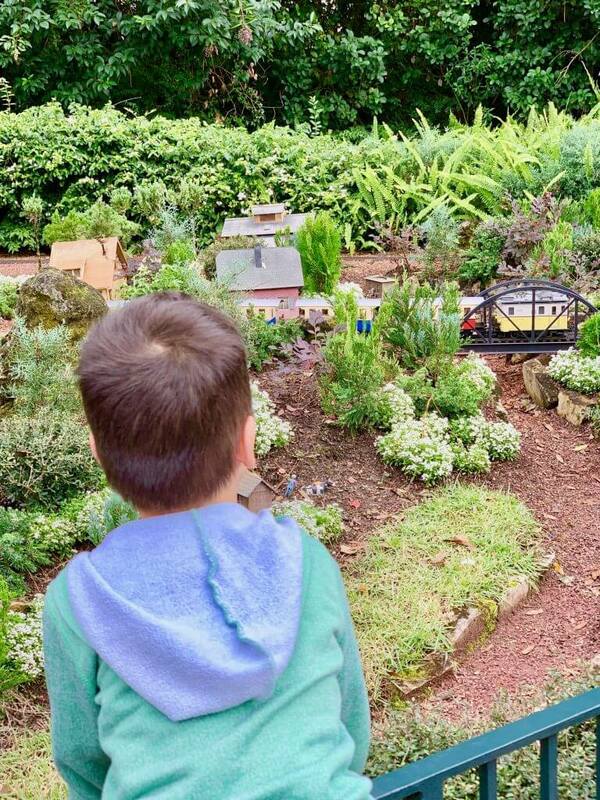 My kids spent a long time watching the trains! We were excited when we got to China! They did a fun lion dance presentation that my oldest got to watch while my toddler napped in the stroller. We also went inside to check out the Disneyland Resort in Shanghai, which looks really amazing! We promptly added it to our bucket list! And because I read a lot of Disney blogs before our trip, I knew to grab school bread in Norway. 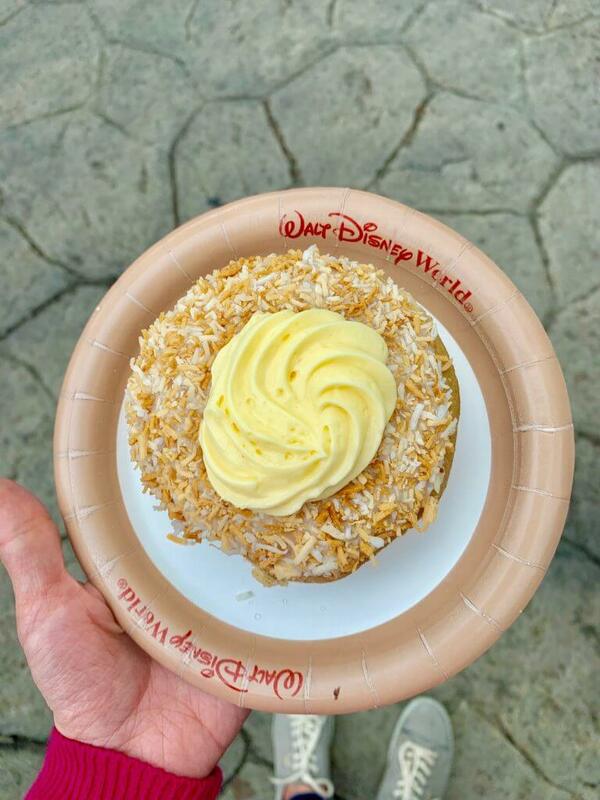 It was a not-too-sweet bun with cream and coconut and it was a perfect afternoon snack! Then, we had FastPasses for Journey Into Imagination with Figment. It wasn’t my favorite ride, but it ends with a cool play area! The kids spent a lot of time there. Plus, there’s a PhotoPass studio between the play area and the gift shop. 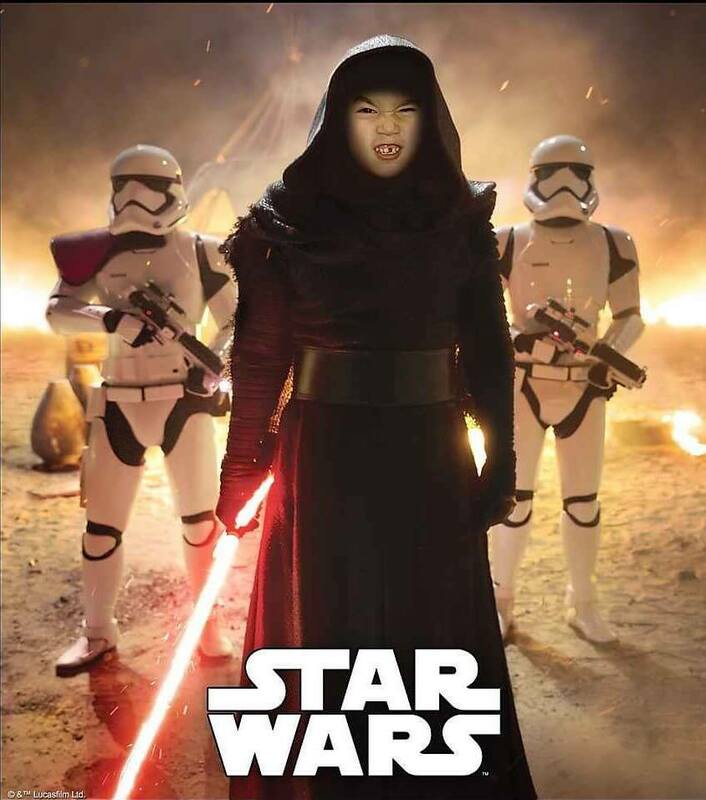 They can superimpose your face into a huge array of movie posters and backgrounds. It’s free to do it just for fun, but if you want any of the photos, you’ll have to pay. We checked the My Disney Experience app and saw that Spaceship Earth only had a 20 minute wait, so we headed there next. Our whole family enjoyed this ride, especially my mom! Since we didn’t do it before, we headed to the Baymax photo op so my husband and oldest could get photos. While we were in line, we saw that The Seas with Nemo & Friends only had a 5 minute wait, so that was our next stop! And right next door was Turtle Talk with Crush, which only had a 10 minute wait. The waiting area is in a cool mini aquarium and the kids were a bit disappointed to leave when they opened the doors! After, the kids played in Bruce’s Shark World until it was time to head to dinner. After walking past this restaurant when we explored the France Pavilion, our whole family was excited to eat here! It was pouring down rain at this point, so we were thankful they had a covered waiting area. Our reservation was for 6pm and we were seated by 6:15pm. The food was delicious and I could have easily eaten here every day of our trip! Luckily, we had leftovers so I got to taste the flavors one more time! While we were waiting for our food, I was able to get my husband and son FastPasses for Mission: SPACE. They did the ride while I checked out the gift shop nearby. My oldest had so much fun that he convince my mom and me to ride it one more time. Since it only had a 5 minute wait, we figured why not! At that point, it was 8:45pm and we decided we better head to the buses to get back to Disney’s Animal Kingdom Lodge. 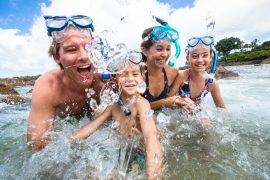 READ Will your Family Love the `Ohana Character Breakfast at the Polynesian Village Resort? If you think you’ll be spending a couple days at Epcot, or you are going specifically for the Epcot Food & Wine Festival, you might consider staying at one of the Epcot hotels. They were in absolute heaven! So many things to do, see and eat! It was an incredible trip! And all the princesses were so nice to us! We loved Epcot when we were there in April. We also ate at Chefs de France and it was wonderful! It’s the most kid-friendly French restaurant ever! United Kingdom has the literal best fish and chips EVER. I swear, it’s magic. Yes! They were super tasty and reminded me of London! Next time we’re definitely spending at least 2 days there. It has such a relaxing vibe and there’s so many tasty treats!